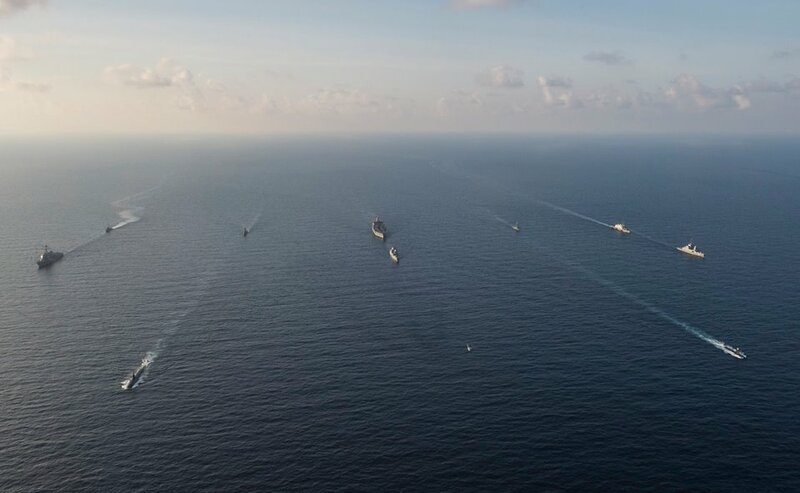 SINGAPORE, -- The Republic of Singapore Navy (RSN) and the United States Navy (USN) conducted a successful combined torpedo firing exercise today as part of the 21st Cooperation Afloat Readiness and Training (CARAT) exercise. 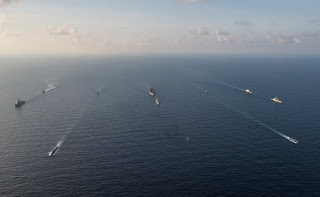 The RSN's Formidable-class frigate RSS Supreme, the Republic of Singapore Air Force's Sikorsky S-70B Seahawk naval helicopter and the USN's MH-60R Seahawk naval helicopter took part in this combined torpedo firing exercise. This year's exercise marked the first time that both navies employed Unmanned Aerial Vehicles (UAVs) to conduct maritime surveillance. The RSN flew its Scan Eagle UAV sorties from its Victory-class missile corvettes, the RSS Vigour and RSS Valour, while the USN deployed its Firescout UAV from the Freedom-class littoral combat ship, the USS Fort Worth.The addition of these unmanned systems provided a new dimension to the conduct of maritime surveillance. Witnessing the combined torpedo firing and the deployment of the ScanEagle UAV were Minister of State for Defence Dr Mohamad Maliki Bin Osman, Fleet Commander Rear Admiral (RADM) Lew Chuen Hong, USN Commander Logistics Group Western Pacific RADM Charles Williams, and members of the Government Parliamentary Committee for Defence and Foreign Affairs (GPC-DFA). They were also hosted to a visit onboard the USS Fort Worth. Commenting on the successful conduct of the exercise, Colonel Seah Poh Yeen, the RSN's co-Commander Task Group for the exercise, said "CARAT Singapore has increased in scope and complexity over the years. The successful conduct of the combined torpedo firing and the UAV operations underscores the high level of interoperability and trust both navies have achieved." His USN counterpart, CAPT Fred Kacher, added, "Anti-submarine warfare is an increasingly important mission set, especially in this region of the world. The success of this year's torpedo firing exercise is an example of our navies' close coordination and commitment to build upon lessons learned from previous CARATs." CARAT Singapore 2015 is ongoing and will conclude on 24 July 2015. The U.S. Navy and Republic of Singapore Navy working hard together during CARAT - Cooperation Afloat Readiness and Training ‪‎Singapore‬ 2015.